Kate Potter will be delivering a presentation at the 2017 Centre for Applied Science in Ontario Protected Areas (CASIOPA) Conference in Collingwood, Ontario. View the full event program HERE. Robert Orland and Kate Potter will be delivering two presentations at the 2017 Latornell Conservation Symposium in Alliston, Ontario. View the full event program HERE. Robert Orland will be delivering two presentations at the 2017 Parks & Recreation Ontario (PRO) Education Forum in Huntsville, Ontario. View the event brochure HERE. Robert Orland will be presenting “Utilizing Lands for Trails” from 9:15 to 10am at the Ontario Trails – Trailhead Hastings event in Bancroft, Ontario. Working with the Region of Peel and the Brampton Real Estate Board, Orland Conservation is coordinating a land conservation workshop for realtors working with rural landowners in Peel Region. 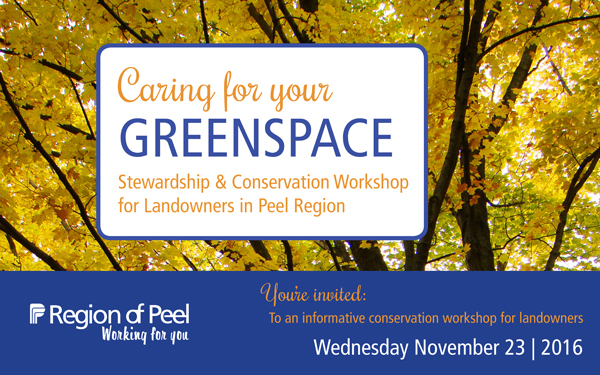 Working with the Region of Peel, Orland Conservation is coordinating a land conservation workshop for landowners in Peel Region on November 23 at the Brampton Fairgrounds in Caledon. The event will feature presentations, informative displays and opportunities for community networking. Robert Orland will be delivering a presentation on Backyard Bounty at the ReForest London Urban Agriculture Symposium in London, Ontario on November 19. More details to come. Robert Orland will be presenting at the 2016 Saskatchewan Parks & Recreation Association Conference: Healthy Communities – Harvesting the Benefits in Regina, Saskatchewan on October 27. Kate Potter will be presenting on land securement with Niall Lobley from Conservation Halton, at the 2016 OLTA Gathering in Orillia, Ontario on October 20. Robert Orland will be presenting “Landowner Contact: Engaging the Community for Conservation” at the 2016 OPPI Symposium in Hamilton, Ontario on October 6. 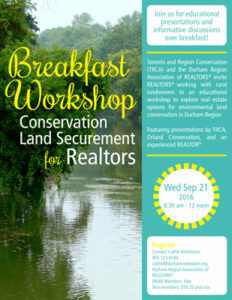 Working with Toronto and Region Conservation, Durham Region Association of REALTORS, and the Toronto Real Estate Board, Orland Conservation is coordinating and participating in a series of two workshops on land securement for Ontario REALTORS®. The morning workshops will take place on September 21 (at the Whitevale Golf Club, Whitevale) and 28 (at the Toronto Real Estate Board Office, Newmarket). 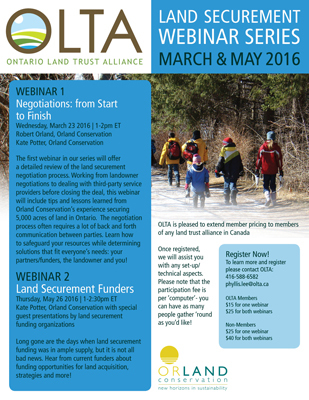 Orland Conservation will be delivering a 3rd series of land securement webinars with the Ontario Land Trust Alliance this March and May. These webinars will appeal to anyone involved in land securement work, and are highly recommended for staff and/or volunteers at land trusts, conservation authorities and municipalities. For complete details, view or download the PDF flyer. Robert Orland and Kate Potter will be presenting at the 2016 Parks & Recreation Ontario (PRO) Education Forum in Collingwood, Ontario on April 7. View the event brochure HERE.